Five more shopping days until the election. If you haven't chosen your lucky candidate yet, I suggest you consider my advice from the last election and vote for the guy with the mop. Alternately, you could paste the candidates' faces onto a set of dice and take your chances. Either way, life will go on pretty much the same after May 2. On the bright side, it's only five more shopping days until I put my campaign cynic to rest, at least until the next election . . . which at the current rate should be in about eight months. I promised to post photos from the Easter weekend ice rescue training course, but the pics are still on a disc in Dryden . . . which is a two hour drive. I could have them emailed, but it takes about the same amount of time drive there and back as it would take to receive them on my snail-paced server. You could scroll down and review the photos from the Atikokan course, but I guess if you've seen one firefighter swimming in ice water, you've seen them all. 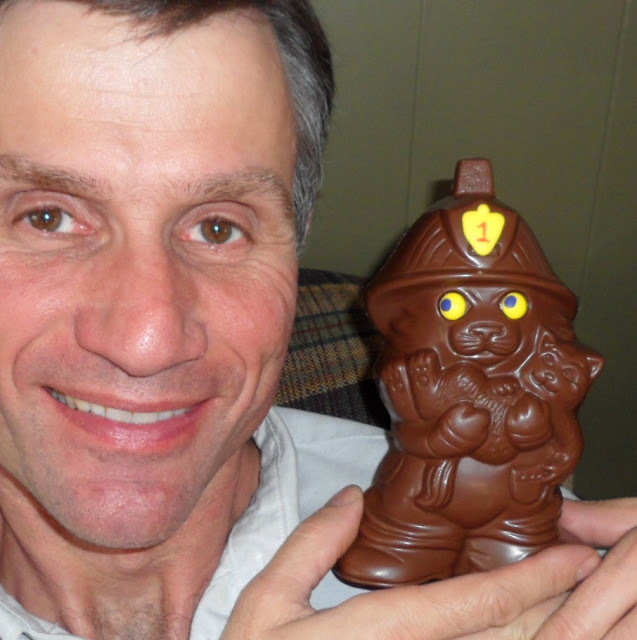 I also said I'd post a photo of me with my chocolate Easter firefighter cat, and I can deliver on that promise. By the way, that's a 50/50 promise keeping record. That should make me eligible for job as either a politician or a weatherman. Tearing myself away from lousy political satire, I saw this story in Firefighting in Canada today about a volunteer rescue crew in the Prince George area that is now asking for provincial assistance. BC's Public Safety Minister was conveniently unavailable for comment on the issue, but I suspect the response will be something like, "fire/rescue is a local problem," or "don't try to board the Wandering River band wagon." Perhaps it's too early to predict, but I wonder if Wandering River and Prince George mark the beginning of the end of volunteer patience with being sidelined. Chad Sartison over at the Fire Within posted an article about sleeplessness in the fire service, which talks about the precarious position in which many volunteer chiefs find themselves, often unawares. On a completely unrelated topic, it snowed again today. The March Lynx is so messed up now that I wouldn't be surprised if he growled his way right into the month of May. On the bright side (there's always a bright side), the blackflies will stay in their lairs for another week or so. Don't forget to vote on Monday, even though things will continue pretty much the same on Tuesday. Remember, there is always a bright side. Give me enough time, and I might even be able to figure out what it is.